Dimensions (mm): 900 long x 240 deep x 75 high. Product Finish: Clear, water based, matte finish.. 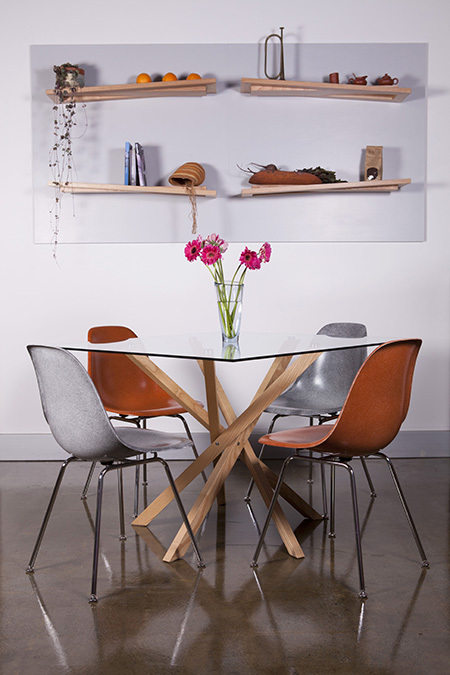 Product Timber Options: Mountain Ash or Silver Wattle or Tasmanian Blackwood or American White Ash. Are these shelves for real? 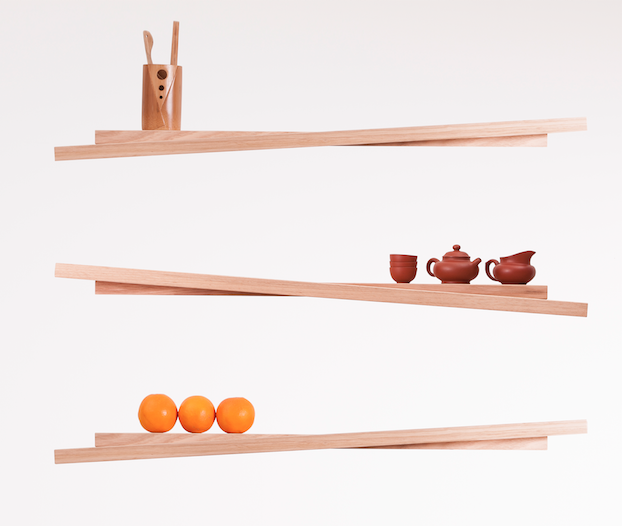 The central section sits perfectly flat, meaning the Rake floating shelves are very functional. However the surrounding frame is not flat at all. And it’s this geometric playfulness which begins to confuse your mind. In fact striking effects and compositions can be created when these floating shelves are grouped together. There is effectively a left hand and right hand version. See, the mind bending is starting already! 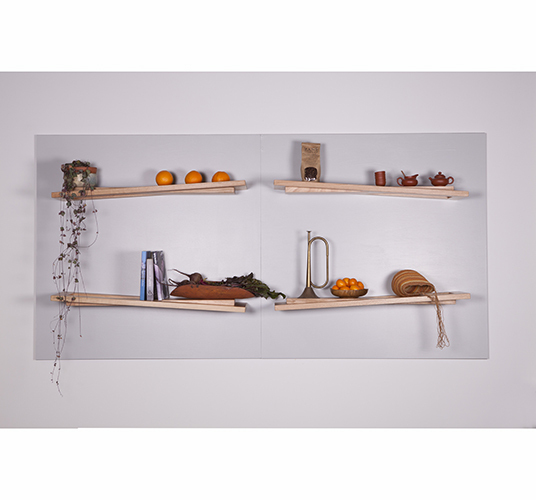 The Rake floating shelves look great as a simple pair of horizontal shelves. They also really suit a vertical stack of three. 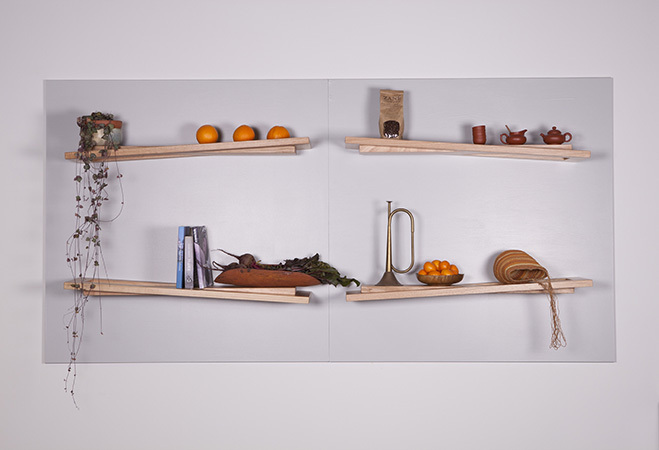 A foursome (two by two) as well as a group of six floating shelves (three by three) can look spectacular. 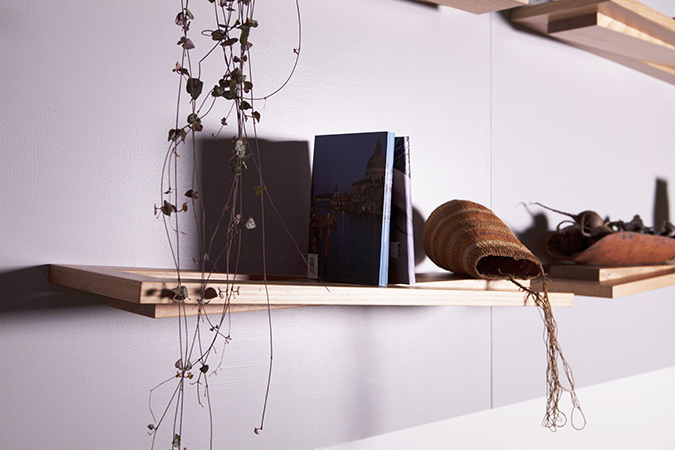 In fact, the larger the amount of shelves, the more intricate and unique the overall effect that can be created. You can also have the shelves in line with each other, or stagger them off centre, if you wish. Masonry Walls. 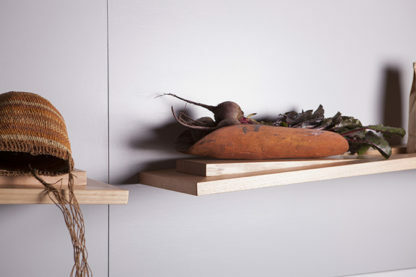 Fit the Rake floating shelves directly onto these walls. Plasterboard with timber studs behind. Not suitable for direct attachment of the Rake floating shelves. Rather, we strongly advise the prior fixing of a solid (eg:15 to 19mm thick) backing board. This backing board is to be fixed by screwing to the timber stud work. After securely fixing, it may be painted as desired. 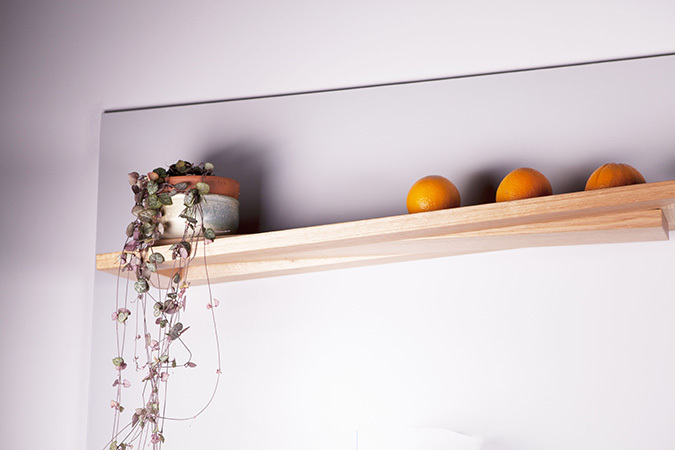 The floating shelf brackets (2 per shelf are provided) can then be securely fitted directly to this backing board. This ensures significantly greater fixing strength which cannot otherwise be achieved. Plasterboard with thin metal frame work behind. Not suitable for Rake floating shelves. We are more than happy to talk you through the best way to hang your Rake floating shelves. Prices listed represent a “per shelf” price – not a group price. The pricing also includes an unpainted 18mm thick MDF board. This is your backing board if fitting to a plaster wall with timber studs (see above). 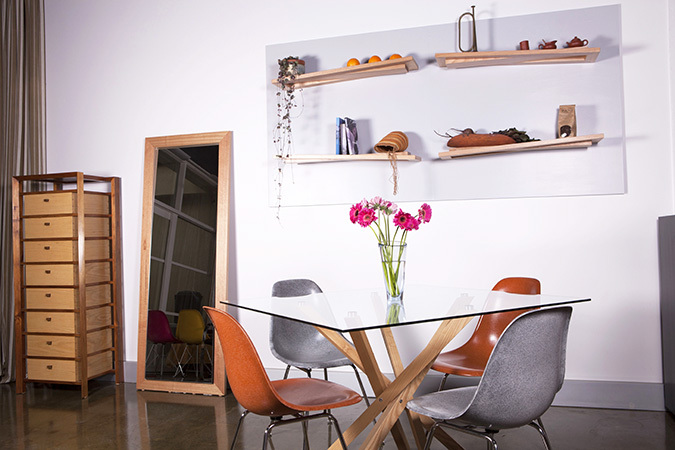 The maximum standard size of any single backing board is 1M x 1M. This size backing board will hold 2-3 Rake floating shelves in a vertical configuration. Of course, multiple backing boards can be grouped together for larger configurations. We are happy to discuss this issue in more detail with you based upon your preferred number of floating shelves and configuration. Simply contact us here. Lead time: Approximately 4-6 weeks. Installation/wall-hanging required and is the customer’s responsibility to organise. Please contact us for assistance/information regarding this, as required.